Detect bugs, vulnerabilities and code smells across project branches and pull requests. This extension provides build tasks that you can add in your build definition. All branches and pull-requests are automatically analyzed, allowing you to discover early any bug or vulnerability in the code. A dedicated SonarQube EndPoint to define the SonarQube server to be used. Prepare Analysis Configuration task, to configure all the required settings before executing the build. This task is mandatory. In case of .NET solutions or Java projects, this tasks helps to integrate seamlessly with MSBuild, Maven and Gradle tasks. Run Code Analysis task, to actually execute the analysis of the source code. Not required for Maven or Gradle projects. Publish Quality Gate Result task, to display the quality gate status in the build summary. This tasks is optional, as it can increase the overall build time. Note for TFS installations older than TFS 2017 Update 2: to install the extension, please follow instructions available on the "SonarQube Extension 3.0" documentation page. The analysis of C# and VB. Net solution is really straightforward since it only requires adding the two Prepare Analysis Configuration and Run Code Analysis tasks to your build definition. If you're doing Java, analyzing your source code is also very easy. It only requires adding the Prepare Analysis Configuration task, and check the Run SonarQube Analysis option in the "Code Analysis" panel of the Maven or Gradle task. Important note: to activate pull request decoration, you must specify a user token in the "General Settings > Pull Requests" administration page of your project in SonarQube. The Publish Quality Gate Result task waits for the analysis report to be consumed by the SonarQube in order to flag the build job with the Quality Gate status. 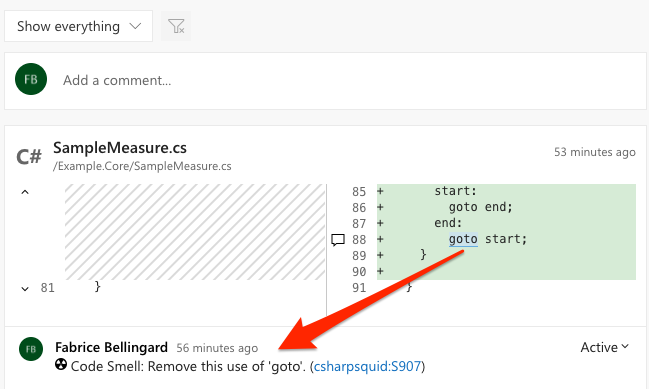 The Quality Gate is a major, out-of-the-box, feature of SonarQube. It provides the ability to know at each analysis whether an application passes or fails the release criteria. In other words it tells you at every analysis whether an application is ready for production "quality-wise". This Get Started guide provides all the required documentation for you to setup a build definition.